The tenth anniversary of Nigeria’s return to civil rule and the second anniversary of President Umaru Yar’Adua’s tenure is being marked the genocidal confrontation between the military's Joint Task Force (JTF) and armed groups in the oil-rich Niger Delta. The JTF, which is comprised of troops of the army, navy, air force and the mobile police, was set in 2004 to tackle the armed groups fighting against the exploitation and oppression of the people of the Niger Delta and the degradation of the natural environment by foreign multinationals involved in the extraction of oil and the complicity and neglect of the corrupt state and federal governments. Since 13 May 2009 the JTF have carried out a military operation on suspected militant camps in the Gbaramatu kingdom of Delta State, using gunboats, helicopter gunships and fighter jets. The JFT claims the offensive is being undertaken to root out militants but a number of villages including Opuye, Okerenkoro, Kurutie and Oporoza, are reportedly razed to the ground and many innocent civilians are reported among those killed. Oil companies operating in the Niger Delta have made record profits, and the various state governments received unprecedented oil revenue, in recent years. Yet the region remains impoverished, with no basic amenities or infrastructure. Oil and gas companies operating in the region import most food in the region due to the decades of contamination of the water and soil. Thus, the military blockade imposed by the JFT effectively means starvation for thousands of people. Federal lawmakers who said the operations should be extended to neighbouring Rivers and Bayelsa States have endorsed the military operation. In response the JTF have attacked Abonnema in Rivers State. Residents of the town Odi in neighbouring Bayelsa State, which was burned down by the Nigerian military in a similar operation ten years ago, have also fled the town in fear of being overrun by the soldiers. The ongoing operation, codenamed 'Cordon and Rescue' which has seen the JTF use dozens of gunboats, several helicopter gunships and fighter jets, is a significant change in the government's approach to tackling a three-year-old insurgency that has disrupted nearly a quarter of Nigeria's oil production. The sheer scale and coordination of the operation are unprecedented and is a chilling reminder of Gordon Brown’s pledge last year to provide the Nigerian military with direct assistance to help return law and order to the Niger Delta in order to restore oil output. It will be recalled that with the unrest in the Niger Delta helping to drive oil prices to the record high of $145 per barrel last summer, Mr Brown announced at the close of the G8 meeting in Japan on 9 July 2008, that: "We stand ready to give help to the Nigerians to deal with lawlessness that exists in this area and to achieve the levels of production that Nigeria is capable of, but because of the law and order problems has not been able to achieve." His comments came ahead of a visit to London by the Nigerian President, Umaru Yar'Adua in July 2008. President Yar'Adua came to power in May 2007 after a flawed election a win that was universally condemned by national and international observers. The European Union, said the polls had “fallen far short of basic international and regional standards for democratic elections and... cannot be considered to have been credible.” The head of the EU monitoring team, Max van den Berg, declared it one of the worst elections the EU had observed. Three months later, Mr Brown was treating Mr Yaradua, another beneficiary of a stolen mandate, to a four-day visit. In addition to his meeting with Mr Brown, Mr Yaradua enjoyed the privilege of tea with The Queen, and a lunch hosted in his honour by the Foreign Secretary David Miliband with a wide range of British Ministers in attendance. Yet the government of President Umaru Yar'Adua has dismantled the anti-corruption body. Despite campaign pledges to tackle endemic corruption he has used his endless rule of law rhetoric as a pretext to nullify the limited progress made by the previous government in tackling high level corruption. He has also failed in his pledge to address local grievances in the Niger Delta. Ironically issues of transparency and accountability did not feature in the speeches made by Prime Minister Brown and President Yaradua at the end of the July 2008 meeting. 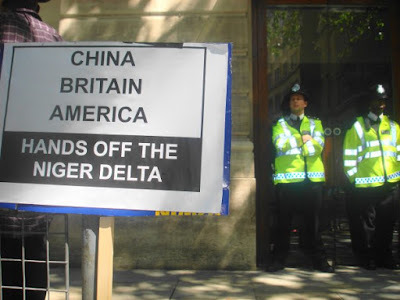 Thus as the UK government continues to assist the Nigerian army defeat the militants the political leaders whose corruption and greed underdeveloped the Niger Delta and many of whom are fugitives from British justice remain untouched in the corridors of power in Abuja. Of particular significance in this regard is the immediate past Governor of Delta State – the scene of the current battle between the JTF and the militants - Mr James Ibori. Mr Ibori was convicted of theft at Isleworth Crown Court in January 1991 for stealing goods from a Wickes shop in Ruislip, where he worked as a check out cashier; and again in February 1992 for handling a stolen American Express Gold at Clerkenwell Magistrates Court. However, by 1999 he had risen in the world, and assumed office as the Governor of the oil-rich Delta State. As state Governor, Mr Ibori’s annual salary was less than £13,000 a year yet he was able to transfer millions of dollars to UK bank accounts with which acquired assets during his eight-year looting spree that ended in May 2007. The Metropolitan Police have frozen some of Mr Ibori’s UK assets worth over £17 million. However, in November 2007, the Nigerian government refused a request by the British authorities to extradite Mr Ibori, who is widely believed to have bankrolled the flawed election of Mr Yar’Adua as president in April 2007, for prosecution for money laundering in Britain. Consequently, Mr Ibori’s wife, sister and three associates including a London-based solicitor Mr Bhadresh Gohil, are currently facing charges of assisting Mr Ibori to launder money in the United Kingdom before the Southwark Court but the principal offender remains beyond the reach of British justice. It did not appear that the extradition of Mr Ibori featured during the Prime Minister’s meeting with President Yaradua nearly a year after the British extradition request was turned down. Nor was the extradition of Mr DSP Alamieyeseigha, the former Governor of the neighbouring Niger Delta State of Bayelsa (where the Nigerian army destroyed the town of Odi and killed scores of civilians in retaliation for the murder of some policemen by a local gang in November 1999) who jumped bail in December 2005 from the United Kingdom to escape charges of money laundering mentioned by the Prime Minister. When Mr Alamieyeseigha was arrested in London in September 2005, apparently after a tip-off from Nigeria’s anti-graft agency, £920,000 was found in suitcases in his £1.75m flat in Paddington. After several weeks in Brixton jail, Mr Alamieyeseigha was released on bail despite the fact that another Nigerian Governor, Joshua Dariye of Plateau State, who faced similar charges of money laundering in London fled to Nigeria after being granted bail the year before. Legend has it that Mr Alamieyeseigha escaped to Nigeria by allegedly disguising himself as a woman but he insists that the British authorities allowed him to escape. The continuing failure of the British authorities (after forfeiting his £1.25m bail bond) to extradite him to the United Kingdom appears to lend credence to his claim. Compared to his ruthless willingness to assist in the armed battle against militants in the Niger Delta, Mr Brown’s reluctance to ensure that the political leaders that impoverish the region face justice even when they have so flagrantly abused the laws of the United Kingdom is the height of hypocrisy and the depth of parochialism. During the pre-election food shortages and cholera epidemic in Zimbabwe in December 2008, Mr Brown branded the Mugabe government “a blood-stained regime that is letting down its own people” and challenged the international community “to say firmly to Mugabe that enough is enough." According to him: "The whole world is angry because they see avoidable deaths -- of children, mothers, and families affected by a disease that could have been avoided." Yet, two weeks after the Nigerian military’s sustained air raids, bombings and blockade have led to the avoidable deaths of innocent children, mothers, and families and rendered tens of thousands more homeless and fearing for their lives, there has been no murmur from Mr Brown; or from any British politician for that matter. 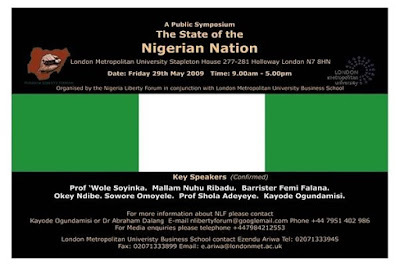 Mr Ogundamisi is the Convener of Nigeria Liberty Forum, which is hosting the Nigerian State Symposium scheduled for 29 May 2009 at the London Metropolitan University, Holloway Road, London.